Clint Powell, (left) representing the Pleasanton Lions Club, presented the Man of the Year award to Keith Powell. Chamber Director Walt Rakowitz (right) assisted. Gracie Powell joined in congratulating her dad. The Pleasanton Chamber of Commerce held their 63rd annual banquet as the City of Pleasanton’s first guests in the new Pleasanton Civic Center. The spacious venue was the perfect setting to showcase the state of the art facility and to recognize area citizens as they were awarded for their devotion and promotion of Pleasanton. Chamber President Chico Cox greeted the attendees and a delicious meal provided by McBee’s Barbeque was served. Cocktails were provided by The Shot Glass and Glazer Wholesale Distributors. Cox introduced the speaker, Bill Blodgett of Majesty Outdoors. The organization provides mentoring and shares hunting and fishing skills with children who have no father figure in their lives. Area clubs nominated, met and voted on each of the recipients. These clubs were assisted by the chamber directors in presenting the eight awards for the evening. Winners and their biographies are featured below. This outstanding woman began her business endeavors early in her life. At age 8, she and her best friend started a cookie-baking company with a simple marketing strategy; they passed out warm samples of chocolate chip cookies in their neighborhood, along with homemade business cards! The strategy worked and soon, they were swamped with business. Formerly, a San Antonio banker, she moved to Pleasanton so that her husband could live closer to his work. Pleasanton’s friendly, small-town setting fulfilled her ideal for raising a family and getting involved. And that is exactly what this Woman of the Year has done. When she discovered that a gift shop, located in a quaint, old building on North Main Street was for sale, she pounced on it, viewing it as a valid business venture as well as a vehicle by which to become more involved in the community. As a business owner, she champions the downtown area – even adding the tagline “located in historic downtown Pleasanton” on all her advertising materials, and she has not stopped there. 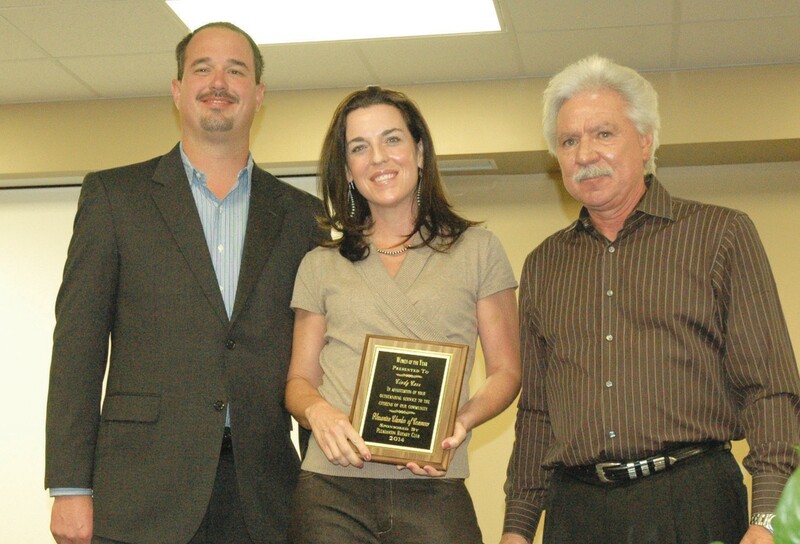 She was pivotal in helping to create the Pleasanton Downtown Merchant’s Association – an Association formed to develop and promote a vibrant downtown community. This businesswoman works each day to expand service in every phase of her life, from her customers at the shop to the people in her community. She exemplifies an attitude of kindheartedness and respect for all. Community involvement is a natural extension of this woman’s service mindset outside her store. With a busy husband and two young children, her life is beyond full. Yet she prioritizes time for community involvement and service. Serving on the board of CASA of South Texas, this mother of two has seen the tragic incidence of violence towards children increase markedly and she is extremely passionate in supporting the organization’s efforts to protect children. She also uses her store for community outreach by hosting special events or by contributing merchandise for numerous charitable organizations. The man of the year attended PISD schools from Kindergarten through High School. Graduated from Pleasanton High School and attended Junior College. He enlisted in the Air Force Reserve in 1991 as a flight medic in the 32nd Aero medical Evacuation Squadron. In 1993 he cross-trained to become a loadmaster in a C5 in the 68th Airlift Squadron. He served two years active duty leaving the reserves in 1998. From there he followed his jobs around the country. In September 2001 he married his wife Kelli. They have two girls, Emily 11 and Gracie 5. They moved back to Pleasanton in 2007 because it was important to him to raise their children in his hometown. From 2000-2005, he worked for Applied Mechanical Consulting as a Lead Facilities Technician who assisted the Project Management Team during construction and start up of the plant. In 2005, he went to work for Skanska in Rio Rancho, NM, building another clean room for Intel. He transitioned to the Texas group in 2008 and worked in the Valley where he built an award winning Performing Arts Center in UT Brownsville as well as a library and classrooms. He also built a $52 million high school in Donna, commuting from Pleasanton. In 2010, he was named Project Manager of the year for Skanska, Texas. Since moving to Pleasanton he has purchased a Golden Chick in Cotulla and hopes to add more restaurants. As a young family he and his wife are very actively involved in volunteer work with the Pleasanton Schools. In 2012 or early 2013, the city of Pleasanton was looking for a Project Manager for the construction/renovations for the new Civic Center and Library on Main Street. Mayor Clint approached him about taking on the job and he agreed. It was then that the Mayor revealed it was a volunteer job. Nonetheless, he took the challenge at great sacrifice to his time and became the project manager for the Civic Center and Library Building Project for the City of Pleasanton. Under his guidance, this project was completed in February of this year. It is for this exceptional volunteering of time and talent for the Pleasanton community that this is awarded to Keith Powell. The 2013 Senior Citizen of the Year is a graduate of Pleasanton High School. Married for 57 years, she is a parent of four children and nine grandchildren. After spending nearly 30 years away from the area, she moved back to Pleasanton in the summer of 1983 where her two youngest sons later graduated from Pleasanton High School. She retired from the Alamo Community College district where she served as Executive Secretary to the Chancellor, Executive Secretary to the President of St. Philip’s College and Recording Secretary for the Alamo Community College District Board of Trustees. Prior to Alamo Community College District, she worked for nine years with the Katy Independent School District, working with mentally handicapped and learning disabled students as an instruction aide. She also ran her own secretary service in the Alamo Bank Building in San Antonio for two years. She has been a member of the Pleasanton Woman’s Club since 1984. She has served this club as first and second vice president and then two terms as president. She has served on the Pleasanton Cemetery Clean-Up Committee. She and her husband donated the use of their home in Pleasanton for the Pleasanton Woman’s Club Thrift Shop, which earns money for community improvement projects, supports charitable organizations of the club, and a scholarship program for the club. She is presently serving as the Historical Foundation Chairman of the General Federation of Women’s Clubs of Texas. She also served on the City of Pleasanton’s Charter Review Board, the Industrial Park Board and the Longhorn Museum Society for over 10 years, helping with their festivals and fundraising efforts. She has served on the board of the Pleasanton Community Center for over six years and has been President for the last three years. This outstanding senior has been a pillar of our community and her tireless work has been critical to the very building we are gathered in tonight. Women like her make our communities what they are today and they deserve our utmost gratitude. This couple has been residents of Pleasanton since 1987. They are parents of four children all of whom graduated from Pleasanton High School. They also have five grandchildren. Gary is a retired Chief Master Sergeant from the US Air Force and a retired Superintendent of the Atascosa County Juvenile Detention Center. Judy is a retired teacher with 34 years of teaching experience. She taught at PHS for 17 years. Gary is currently selfemployed in Pleasanton as a licensed Chemical Dependency and Anger Resolution Counselor. His business is CTC Services. Gary volunteers his counseling services for those who cannot afford to pay. He also volunteers as a mentor to students who are working on their counseling certification. They are both CASA volunteers of South Texas acting as advocates for children who have been abused or neglected who are under state care. They spend many hours visiting their cases, appearing in court and attending meetings. They helped with CASA’s Hill Billy Days barbeque fundraiser. Both are members of the Longhorn Museum Society where they participate in the museum’s fund raisers: Yesteryear Festival, Quilt Raffle Fundraiser, and the Museum Dinner Fundraiser. Judy and Gary volunteer to help with PHS Project Graduation . They sold 50- 50 tickets at home football games, are selling ducks for the P-Town Duck race in March and help to collect business donations to Project Graduation. Gary is a member of the Texas Association of Addiction Professions. He is currently the State Conference Chair of Audio Visuals. While Gary is setting up audiovisual equipment for each workshop, Judy is volunteering at the Legislative Advocacy booth. 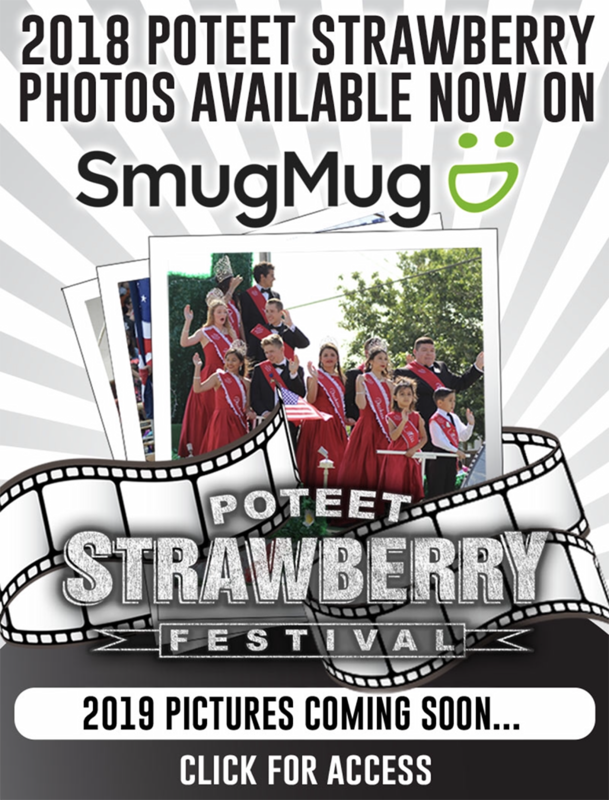 He is a member of the Poteet Rotary, Poteet Strawberry Festival Committee, a member of the Atascosa County Law Enforcement Association and the Atascosa Rifle and Pistol Club. Judy is a member of the Woman’s Club of Pleasanton where she is second vice president in charge of programs. She volunteers at the Club’s Thrift Shop every Monday. She participates in all their projects such as making pillowcases for the Christus Santa Rosa Pediatric Oncology Ward and serves as a judge for woman’s club Alamo District club reports. She collects cell phones for Verizon’s “Cell Phones for Soldiers.” This years cell phone funds will go to the Atascosa Crisis Center. Judy created decorations for a luncheon table for the PISD New Teach Orientation lunch sponsored by the Woman’s Club. She is a member of the Atascosa-McMullen Retired School Personnel organization and is serving as local chair of the Texas Retired Teacher’s Children’s Book Project of collecting, buying and distribution of books to local schools, the juvenile detention center CASA children and day care centers to encourage reading. (Gary assists in the heavy lifting and delivery of books. In their spare time, Judy and Gary like to camp, fish and explore old junk stores. They are hooked on Genealogy research and Judy has recently sent in her application for membership in the Daughters of the American Revolution. Being able to come back to his hometown to open a small business is something that Matt Martinez always dreamed of. Matt was born and raised in Pleasanton. He attended high school at PHS where he played football, basketball, and track – you could say he bleeds Eagle Green. Proud of his hometown and wanting to contribute, Matt developed life-long friendships that would later support him as he opened The Spork in the Road Food Truck. Matt was a student at Texas State University in San Marcos working at Barton Creek Country Club catering and serving at events like the Grand Slam Jam, where he met and catered for Lars Ulrich from the band Metallica, country singer Toby Keith and tennis greats Andre Agassi, Pete Sampras and John McEnroe. During his college years, working at several high end restaurants in the Austin and San Marcos area, Matt discovered his love for cooking. Even his college roommates could attest to the fact that Matt could whip up an amazing meal consisting of only leftovers. So with this, Matt followed his dreams and in 2007 enrolled in The Culinary Institute of America. Martinez has catered for country singer Randy Rogers, “Sake of the Song” Festival and in 2010 he opened up the Railyard Bar and Grill in San Marcos as the Executive Chef. It was at this point that Matt decided to make his own dreams become a reality – he wanted to open and own his own restaurant and he wanted to do this in his beloved hometown of Pleasanton. In 2011, Martinez reconnected and fell in love with his Pleasanton High School friend, Molli Crowley Martinez. The Martinez Family knew that Pleasanton was where they wanted to be, to grow their business and their family. Martinez set out to open, The Spork in the Road food trailer and it has been a whirlwind of hard work and success along the way. In 2012, Matt was selected as a contestant on the Food Networks, Chef Wanted, hosted by Anne Burrell. In 2013, Martinez again received national honors by being selected as a Top 10 finalist for the Television show Hell’s Kitchen. Matt is very dedicated to the community of Pleasanton and is excited to see the expansion and growth that is transforming his town. Martinez participates in the annual Turn-N-Burn competition, catering for singer Rick Trevino and has also catered for Kevin Fowler in the Eagle Ford Shale Bash. In his spare time, Matt volunteers to read with students at Somerset Elementary School, where his wife Molli, is a third grade teacher. Matt is very thankful to his wife Molli, his step-son Peyton and his nine month old son Trevor, along with his family and friends who are deeply rooted in Pleasanton and the community, for giving him the opportunity to do what he loves and to do it where he loves, Pleasanton, Texas. The Business Person of the year was born in San Antonio and graduated from Pleasanton High School. He decided that he wanted to raise his own family in Pleasanton after serving in the Air Force. He served in the Air Force as a Security Police Officer at Randolph AFB. While serving at Randolph, he volunteered as an Emergency Medical Technician in Atascosa County. He was President of Pleasanton EMS for 3 years. In 1999 he graduated from the San Antonio College Law Enforcement Academy while working full time as an EMT-Intermediate in Pleasanton. Upon completion of the Law Enforcement Academy, he began volunteering as a Pleasanton Police Officer for nearly two years before going full time. He was promoted to Sergeant before applying to the Pleasanton ISD to create its Police Department. He worked for the school district for four years as the Chief of Police. With summers off he decided to start a small lawn business to supplement his family’s income. 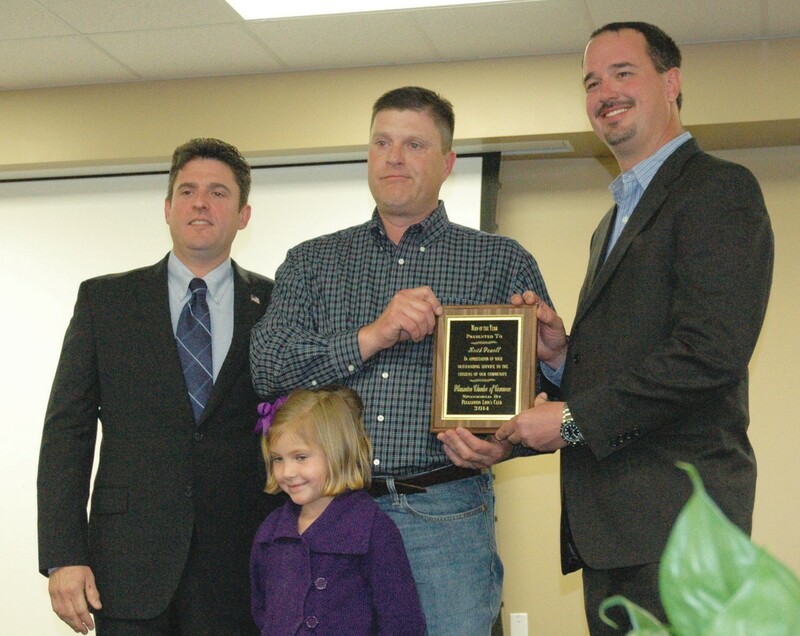 He created Ranchscapes, providing lawn, tree service and landscaping. He had the need for a trailer and found the process aggravating so he started selling trailers himself.. He and his wife sold their home and vehicle and moved their two daughters into an RV at their place of business on West Oaklawn Road in Pleasanton. He believes that God sent him to sell trailers, have a successful business and help the community. He kept the name “Ranchscapes” as a reminder of having to do manual labor for extra money to help make ends meet. With his determination, work ethics and strong faith he has become one of Big Tex Trailers top selling stores. In April 2013, this business person opened Ranchscapes Steel & Supply on Hwy 16 in Jourdanton, Texas. This business brings steel products that are primarily sold in San Antonio to the Atascosa area. In 2011 he joined the Pleasanton Hispanic Chamber of Commerce and served as Vice-President. In January 2014, he was elected as President. He has been married for 15 years and has three children ages 13, 10 and 5 months old. He attends St. Andrews Catholic Church and Cowboy Fellowship. His devotion to the Lord is what has motivated him and kept him sane in the stressful world of business ownership. He always says “When times are difficult the Lord will provide” and he does. He looks forward to preparing his two businesses for long term success for his children to take over one day. The 2013-14 Teacher of the Year came to Pleasanton Independent School District in 1990 as the Junior High School Band Director. He moved from that position to Charlotte where he became the High School Band Director and subsequently returned to Pleasanton High School. He has also worked as the Kenedy Jr. High and High School Band Director. He has achieved an Associate of Arts Degree from Blinn College, a Bachelor of Music Education as well as a Master of Music from UTSA and he is also a Certified School Counselor. In addition to teaching band, preparing students for solos, quarters, duets, etc., our teacher of the year teaches a jazz band and of course, prepares the Pleasanton High School Marching Band for all those fabulous Friday night football half time shows. And then there is UIL marching and concert contests. Oh, yes, let’s not forget special events such as playing at other venues and marching in parades, and private assistance where it’s needed. His hard work shows in his success at the UIL contests, both with his award winning bands and his award winning individual students. But he also finds time to coach the Pee Wee Bowling League, teaches Sunday school and teaches Vacation Bible School at St. John’s Lutheran Church. Students love and respect him. They take pride in being a member of the Eagle Band. He demonstrates great compassion and understanding when working with his students, he has the respect of not only his students, the music community, but also his fellow teachers. He is married to Annette and they have two children Elaine and Lillian who attended Pleasanton ISD. Annette also works for PISD at the Co-op for special needs children. 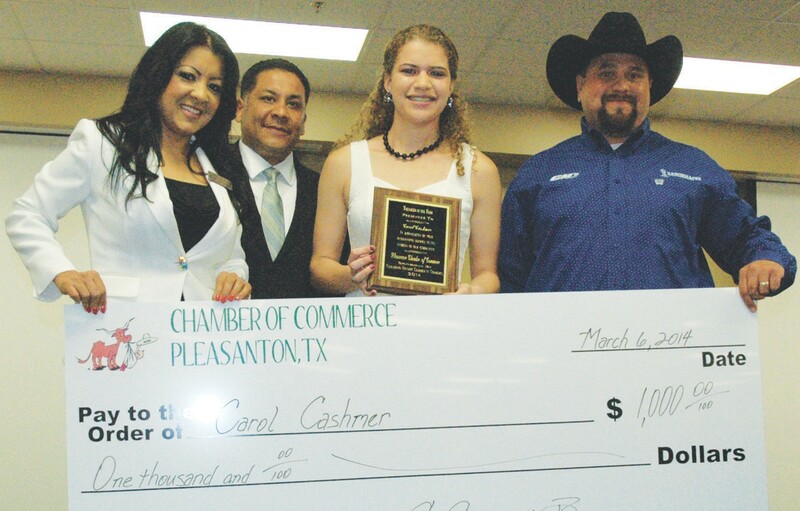 The 2013 Outstanding Teenager of the Year is currently a Senior at Pleasanton High School. Being a natural athlete, she has participated in cheerleading since second grade and is now serving as the varsity cheer captain. She has been a member of the Pleasanton High School varsity track team for four years and has played on the PHS basketball team for three years, winning All District Academic and All Tournament awards. This young woman has been in band since the sixth grade, playing trumpet, baritone, and marching tuba…you can’t miss her on Friday nights at halftime…. she’s the tuba player wearing her cheerleader uniform! She is a member of the Wind Ensemble and has performed at Tuba Christmas in Corpus Christi as well as in a parade at Walt Disney World. She has been in National Honor Society since her sophomore year and just this past summer was inducted into the National Society of High School Scholars and nominated to attend the Extreme Youth Leadership Camp in 2012. She competed at the regional level with Business Professionals of America her freshman year and was awarded Perfect Attendance her junior year. Our student of the year is very active both in the classroom and out…giving back to the community is always one of her top priorities. She attends St. Luke’s Catholic Church where she has helped with their annual festival for the past six years. She has been a member of the Leo Club since sixth grade. 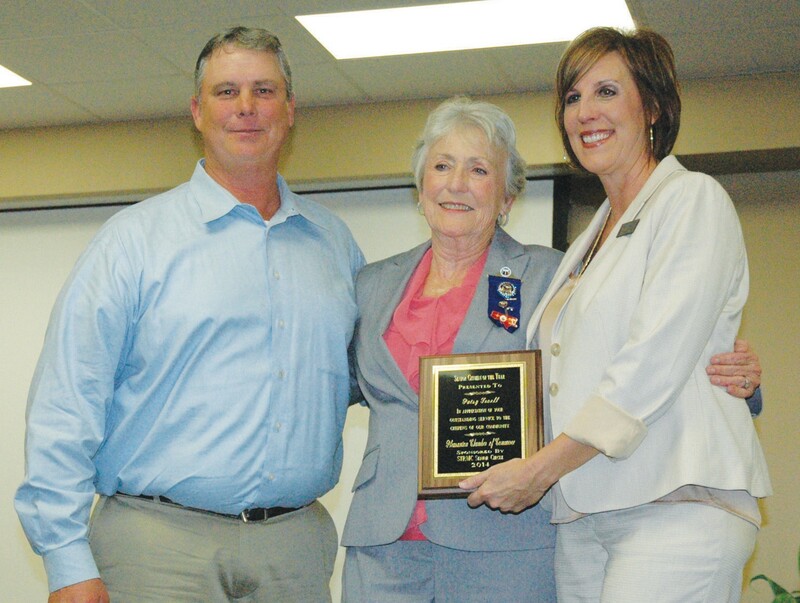 In this club, she has assisted the Lion’s Club with Cowboy Homecoming and Wild Game Dinner events. She has served food to disabled children at the Texas Lions Camp and served Thanksgiving dinner to tenants at Argent Court. She has volunteered at numerous highway cleanups along 97 and at Skeeter Bass Champs events in Choke Canyon. As a fundraiser for the Leo Club, she provided free DJ services for junior high dances, creating a safe and fun environment for the youth of the community. She served on the State Leo Council and was Club President from 2011 -2012. She also won the Leo of the Year Award for 2010-2011. She has provided free DJ services for Rotary Youth Leadership events, the 8th Grade Gala and the PHS prom. She has volunteered at National Night Out, Peace Out To Bullying, the Sandhill PPA Pig Sales, and Family Day in Jourdanton. She has volunteered at numerous blood drives, even donating blood herself. This busy teenager worked in the past at Bill Millers and is currently working at Taco Bell. The highlight of this young woman’s senior year was on September 25, 2013 when she was sworn in to the US Army to be an Unmanned Aerial Vehicle Operator, or drone flyer. She will complete her basic training in Fort Sill, Oklahoma and her job training in Fort Huachuca, Arizona. She will attend college while serving her country in hopes of receiving an MBA and promoting within ranks. Walt Rakowitz (left) representing the Pleasanton Rotary Club, presented the Woman of the Year award to CIndy Carr. Chamber Director Brad Mumm (right) assisted. Chamber husband and wife team Claudia and Jason Reyes present a scholarship ceremonial check to Teenager of the Year Carol Cashmer and David Douglas (right), Hispanic Chamber President presented the award. 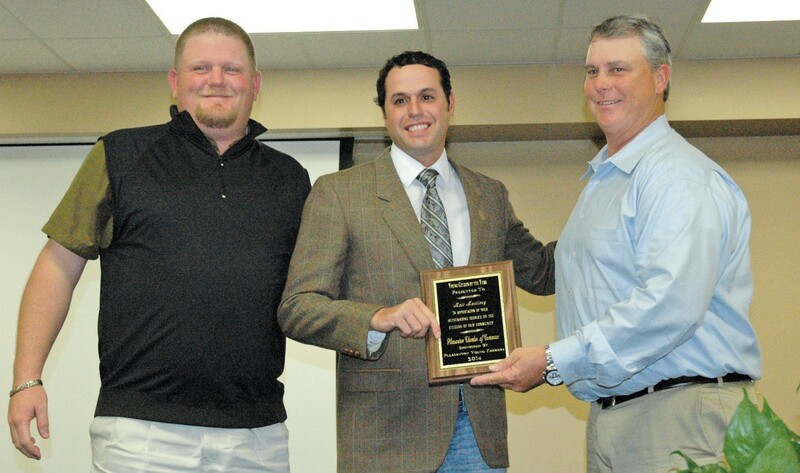 Wade McBee, (left) Chamber 1st Vice President, presented the Business Person of the Year award to David Douglas. Chamber Director Jackie Brown (right) assisted. Patsy Troell (left) of the Pleasanton Woman’s Club presented the Couple of the Year award to Judy and Gary Greene. Chamber 2nd Vice President Candace Trevino (right) assisted. Matt Martinez was awarded Young Citizen of the Year at the Pleasanton Chamber banquet. 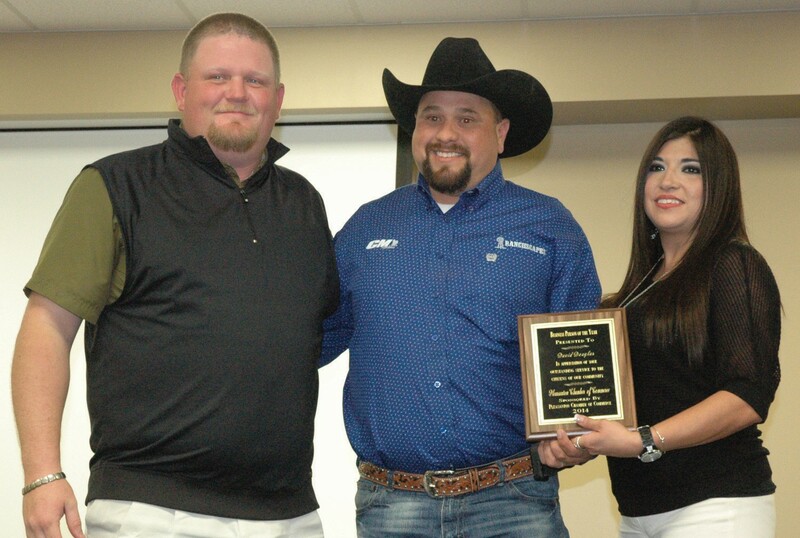 Wade McBee, (left) representing the Pleasanton Young Farmers,(right) presented the award with Chamber President Chico Cox assisting. 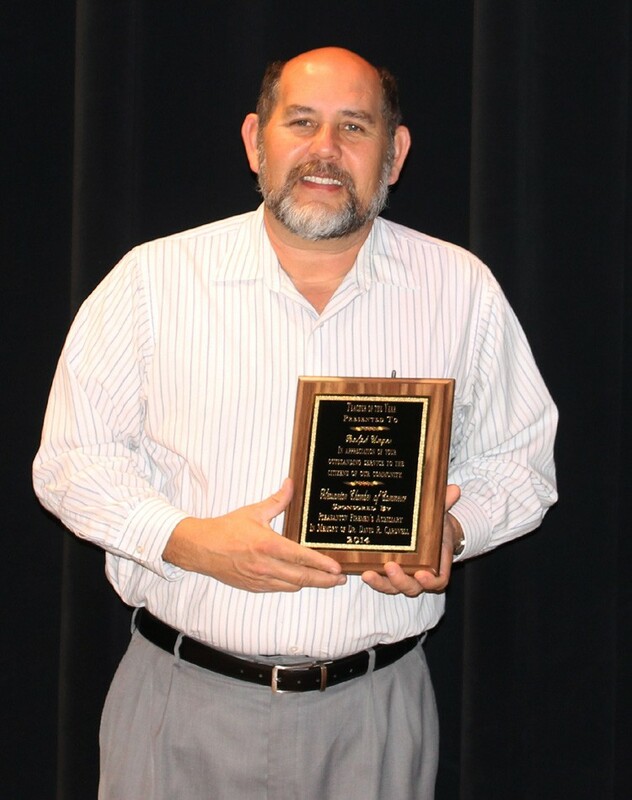 Ralph Unger was awarded Teacher of the Year at the annual chamber banquet. The award was sponsored by the Pleasanton Firemen’s Auxiliary and presented by Margie Mendez. 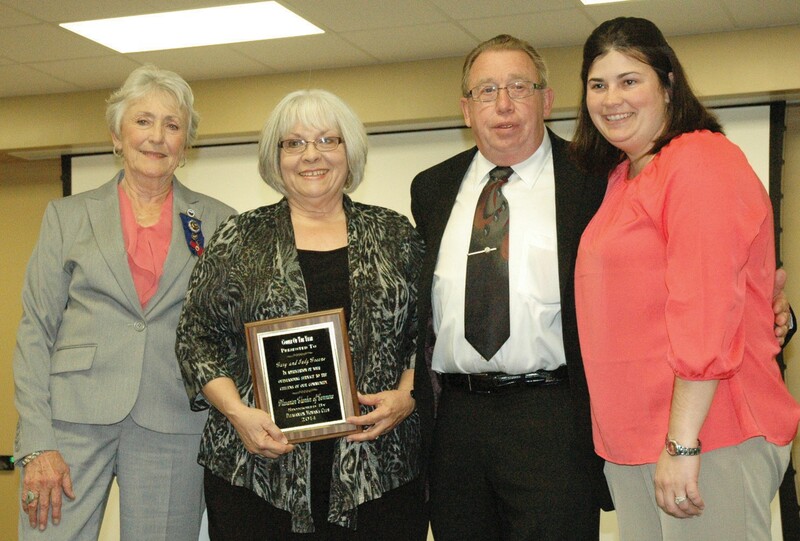 Patsy Troell, center, receives the Senior Citizen of the Year award from Chico Cox, representing the STRMC Senior Circle and his wife Chamber Secretary Pat Cox.